As we bump our way down a leafy lane, a white-tailed deer pokes its head out to see who’s come to visit. 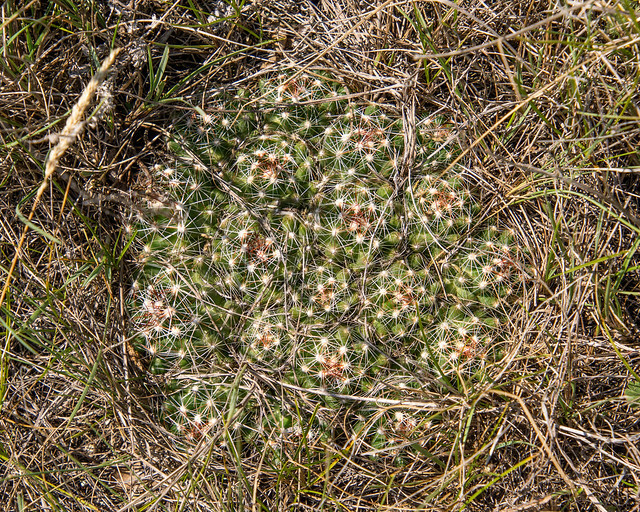 Verity Moore-Wright, Acting Director of Development, and Ryan Dudragne, Conservation Science Co-ordinator – LIS, have invited us (Andrew and Penny McKinlay) to join them on a hike around one of the Nature Conservancy of Canada’s newest properties near Dundurn. Rolling hills – stabilized sand dunes – stretch out to a clear blue sky. A red-tailed hawk soars overhead and there are treasures to be found at our feet. 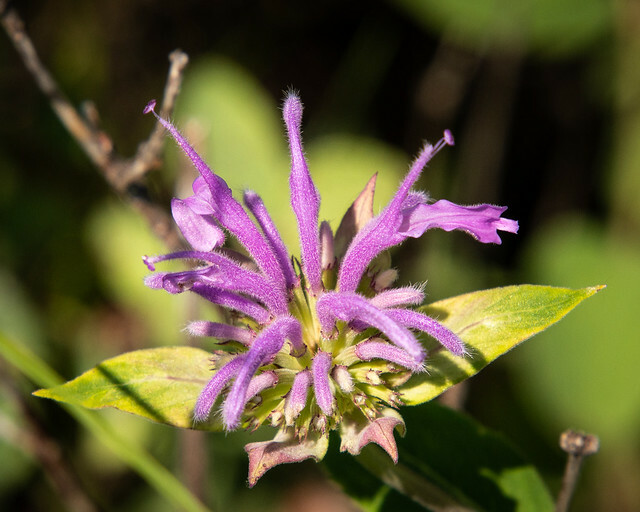 A patch of wild bergamot is flowering near the entrance to the property attracting long-tongued bees, bee flies, butterflies, and moths. Wasps may steal the nectar by drilling a hole in the nectar tubes. 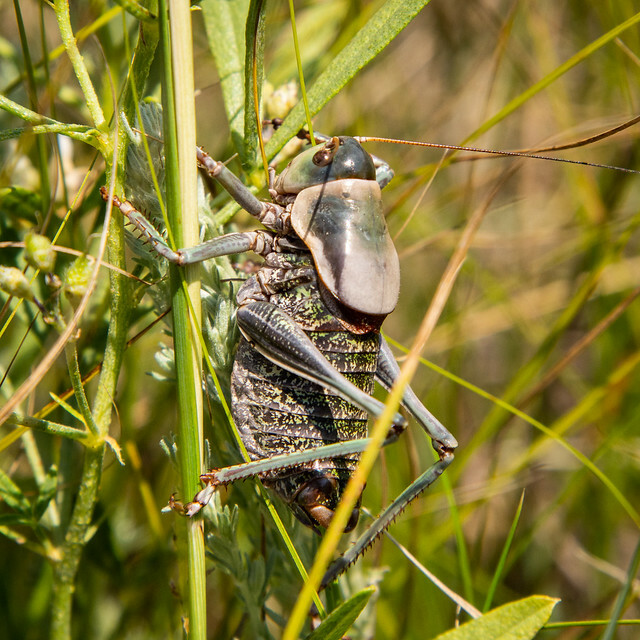 We’re delighted to spot a hunch-backed Mormon cricket. 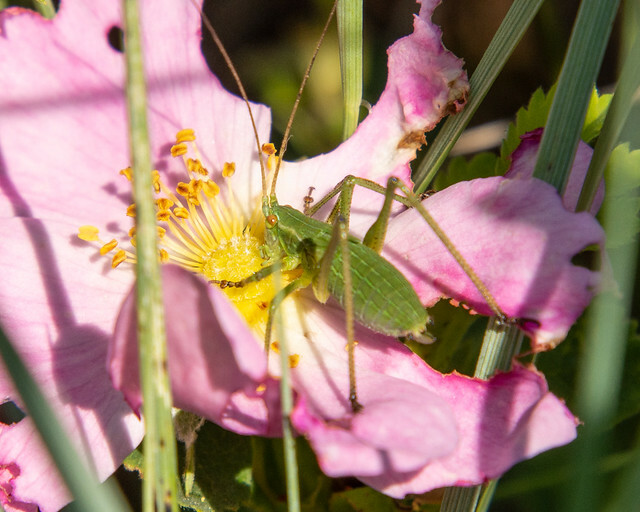 It’s not a cricket at all but a shield-backed katydid. Although they have no wings, they can travel up to 2 km a day when they’re swarming, heading out in the thousands to find food. There are plenty of other grasshoppers and katydids. 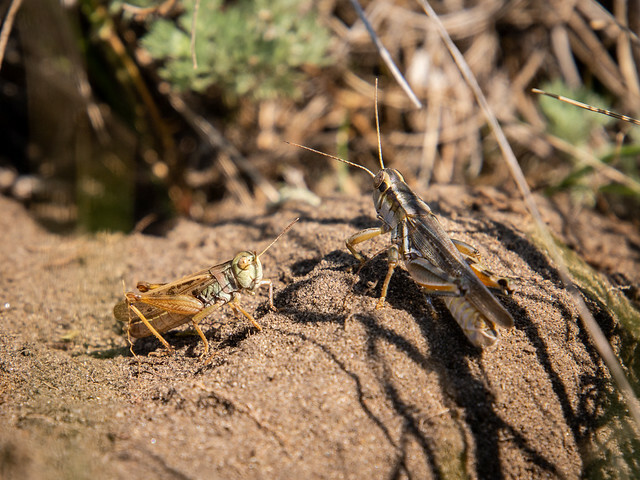 We tend to think of grasshoppers as pests, but only a few of them destroy crops. There is such variety in their sizes, colors, and patterns. We weren't initially able to identify the following insect, but, with help from iNaturalist, we now know it's a Broad-winged Bush Katydid (scudderia pistillata) late instar nymph. 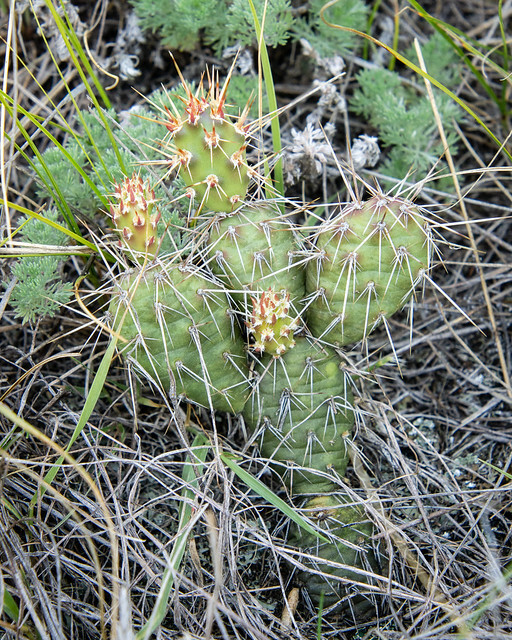 We need to watch where we step as there are plenty of cactus – both pincushion and prickly pear. 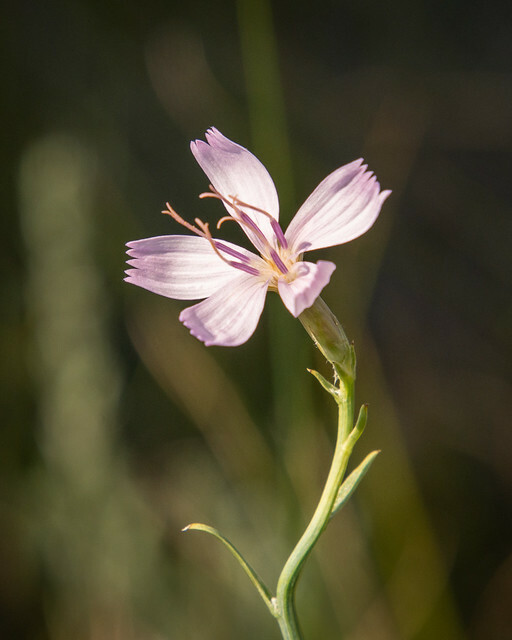 The rush skeleton plant, with next to no leaves, is another plant that can tolerate dry conditions. 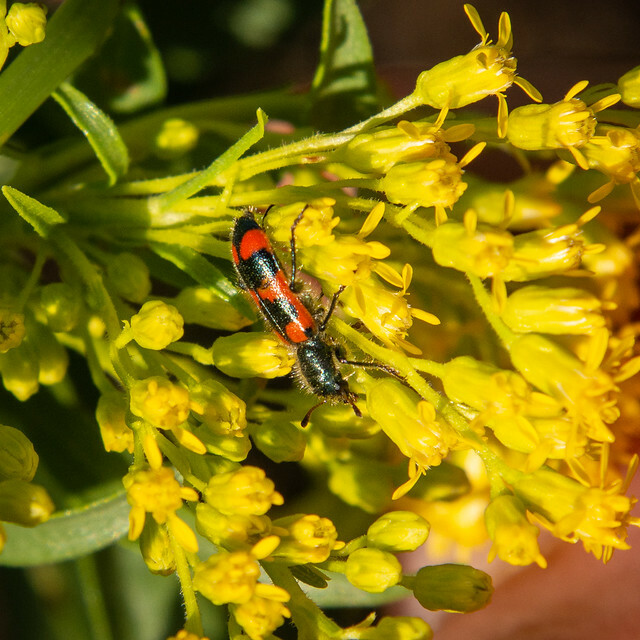 The red-blue checkered beetle stands out against the goldenrod’s bright yellow flowers. 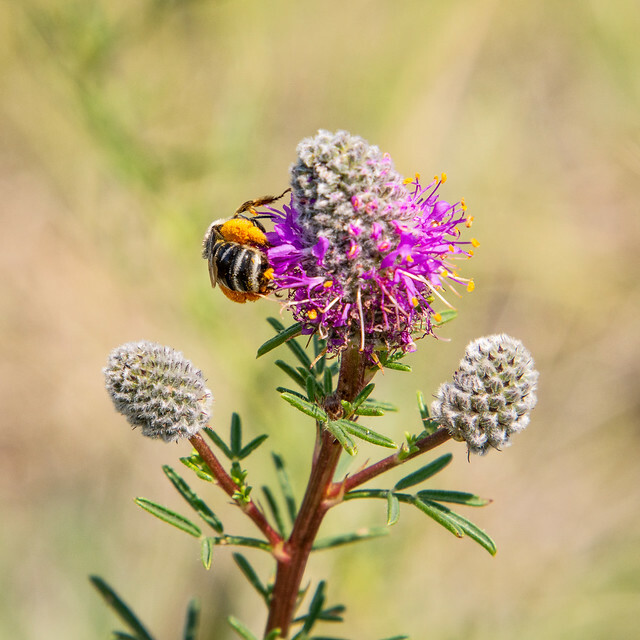 Pollen will stick to the long hairs on its body and legs and be passed along to other plants. 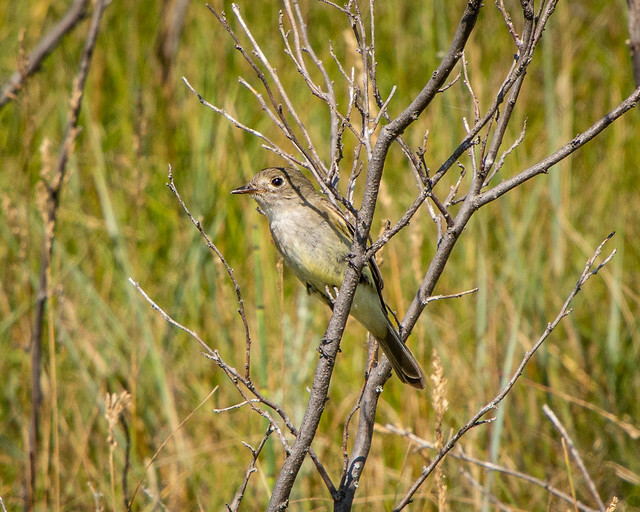 A flycatcher keeps a close eye on us as we pass by, but many of the site’s inhabitants are harder to spot. They do, however, leave us clues – moose poop (these guys are part of Ryan Brook’s Saskatchewan Farmland Moose Project), a freshly dug badger hole, heaps of loose dirt left behind by pocket gophers. If you look really closely at the loose dirt, you’ll spot small round holes indicating the homes of tiger beetles. Ryan describes them as predatory bullies, dragging other insects into their hole or chasing them down. We’re hot and hungry after a long walk around the property but very grateful to Nature Conservancy of Canada for inviting us out to see the site and for the important work they do in protecting natural areas and maintaining biodiversity. And a special thank you to Ryan who was so helpful in identifying all the fascinating species we were fortunate enough to spot. 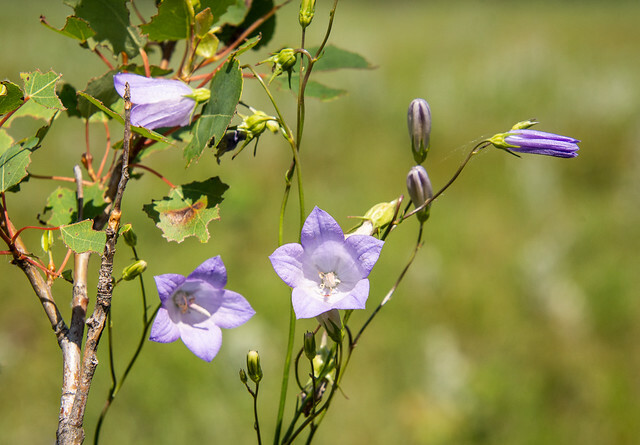 For more information about the Dundurn site and the work of the Nature Conservancy, take a look at the article we posted in May.